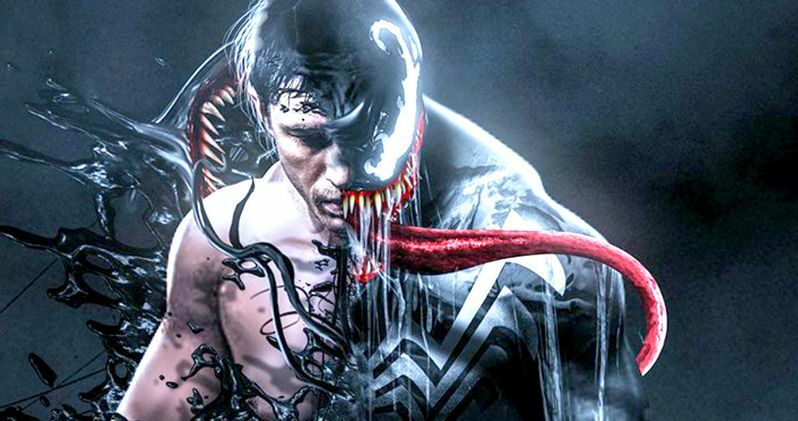 It was announced yesterday that Tom Hardy will be portraying Venom in the new Sony Marvel Universe (aka the SMU) and today we get a glimpse of what that could look like through some imaginative fan-made art. Hardy is all set and excited to play the roll of Eddie Brock in the upcoming Venom movie, but what will happen with Sony's own division of Marvel? We do know that the movie will carry an R rating and will launch in the fall of 2018, marking the first movie of Sony's Marvel Universe. The news of a standalone Venom movie is long over due, especially when one thinks about his appearance in Spider-Man 3. Some fans would like to forget that version of Venom even exists, but it did prove that Venom is an in-demand character, ready for his own anti-hero movie. Sony's Venom is still over a year away and there is not a whole lot of information regarding anything specific. That's where Boss Logic comes into play. After the exciting announcement, Boss Logic shared a rendering of what Tom Hardy as Venom might look like through his Twitter page. The image is dark and shows Venom taking over Hardy's Eddie Brock and we're in for a treat if Sony gets it half as cool as Boss Logic. Boss Logic also did a rendering of what Armie Hammer could look like as Shazam! to equally awesome speculation. You can almost visualize Boss Logic's version of Shazam! fighting Dwayne Johnson's Black Adam on the big screen. Boss Logic's take on Venom is less about Tom Hardy and more about the classic look of Venom taking over a muscular frame. The takeover looks less hostile then would normally imagine, a calm Hardy making his transformation from light to dark. Some fans have been skeptical of the new announcement of Hardy portraying the legendary Venom, but for the majority, he is the obvious choice. Hardy is no stranger to the comic book movie universe having played Bane in Christopher Nolan's The Dark Knight Rises and he was also set to appear in Suicide Squad for a hot minute before scheduling conflicts took over. Hardy's villain Bane was a formidable performance that elevated Nolan's movie into an even darker realm than anticipated. It is easy to see Hardy as a brooding Eddie Brock and he has the acting experience to develop the character and make it his own. Sony's Venom will launch into theaters on October 5th, 2018 and as previously mentioned, it will be the movie to kick off Sony's Marvel Universe. Where it goes is anybody's guess at this early stage of pre-production, but one thing is for certain; Hardy and Sony are genuinely excited to bring Venom to the big screen and fans are just as excited (for the most part). Let's all just try and forget about Topher Grace's portrayal of Venom and pray that Hardy completely erases that image from our minds. Check out Boss Logic's fan-art below.